Background Events: The events that does not require the user action are known as Background Events. Software interruptions, and operating system failure are some background events. Foreground Events : The events that require the user interaction are known as Foreground Events. 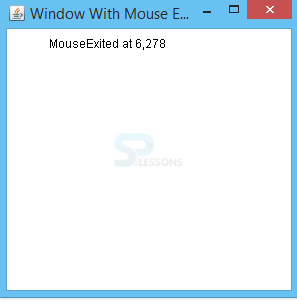 Mouse click, and entering a character from the keyboard are some examples. Event Classes determines an event. 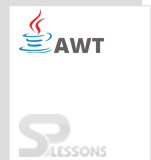 It is the base class for all the AWT Events from which event objects are derived. java.util package is required to use these classes. An event initially generates an object called protected Object source. 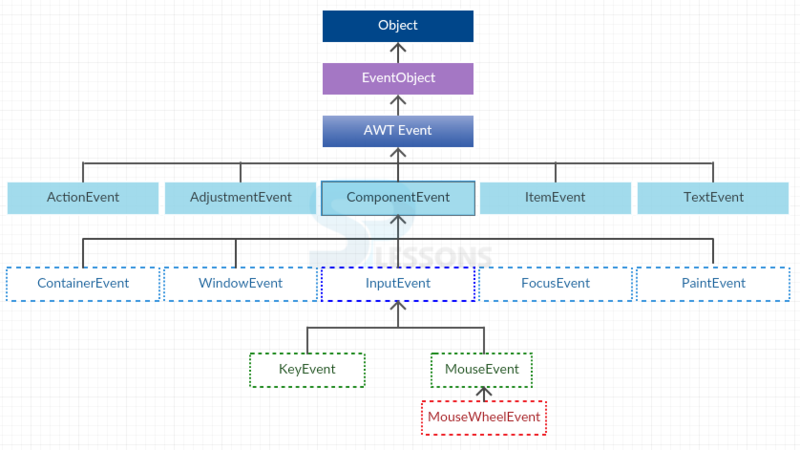 When an event occurs, a object is generated and a notification goes to it to listen the AWT Events. 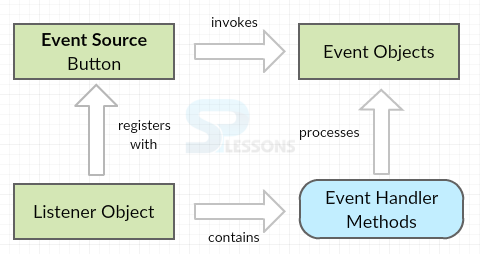 Event Object class is the super class of event listener object classes. FocusEvent Component FocusListener Created when a component lose or gain keyboard focus. ItemEvent CheckBox,CheckboxMenuItem,Choice,List ItemListener Created when list-item or checkbox is pressed. 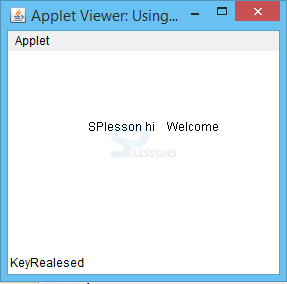 KeyEvent Input from keyboard KeyListener Created when a input is given from the keyboard. TextEvent Text Component TextListener Created when the textarea or textfield value is changed. WindowEvent Window WindowListener Created when window is opened, closed, activated or iconified. ComponentEvent Component ComponentEventListener Created when a component is moved, set visible, or hidden. ContainerEvent Component ContainerListener Created when a component is added or removed to/from the container. AdjustmentEvent Adjustable AdjustmentListener Created when the scroll bar is accessed. Listener interfaces have abstract classes which gives null implementation of all the methods in that interface. Without directly implementing the listener interface, one can extend the adapter class and override the required methods. These methods will be empty. Event Class is the base class for all events. Event Listeners listen to the events. Handling events has components: Events, Source and Listeners. Adapter classes have abstract methods. windowClosing() method cleans up the code when the program is closed. To avoid that one can use the ToDoList() method, which backups the code.